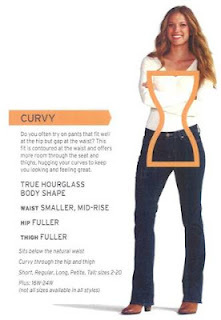 Women will spend almost a quarter of their lives searching for the right pair of jeans. Note, none of this is scientifically proven, I just wanted this post to garner some faux geekdom. The quest for the perfect jean was once feared to take a lifetime, now it's the click of the mouse. My go to brand for the past year has been NYDJ. 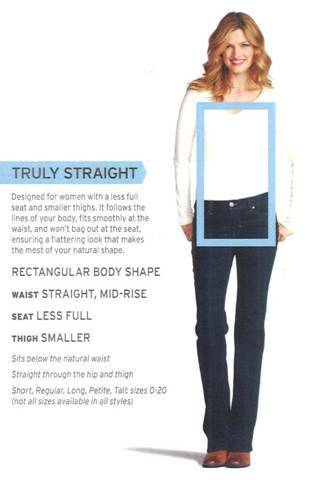 Sold in Nordstroms, NYDJ truly makes you look a size smaller. With it's properly placed pockets, the patented control panel and two way sturdy stretch, NYDJ makes a curvy lady like myself not feel like an awkward cone in teenage pants. I look at NYDJ as my wardrobe classics, my grown up jeans my professional booty boosters. However, sometimes a girl wants to be a little trendy and channel her inner Charlie's Angel, that's when Raven Denim comes into play. The trouser jean is as close to evening denim as you can get. The Selma Raw is a dark and sturdy denim with a lean trouser leg. I like to think of this line as my power denim, sleek and chic. Native New Yorker that I am, my wardrobe isn't always dictated by my region. If that were the case, I'd rock the same pair of denim every inner Brooklyn girl is wearing right now and clearly that ain't me. When I can't travel I still want my clothing to take me some where else. Right now, I'm feeling very Los Angeles and Level 99, helps me channel my wannabe West Coaster. 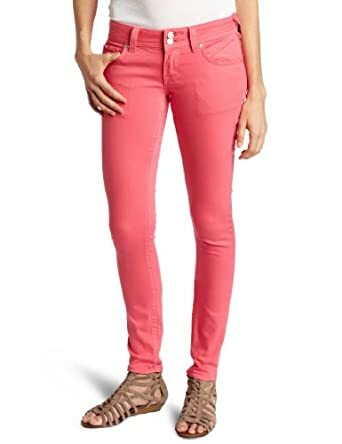 I'm not sure if it's the rainbow colors in the collection or the fact that the line is much loved by much of Hollywood, but it is a true just the right the fit skinny jean. I still keep it frugal when it comes to the search for the perfect jeans. That's where Vigoss USA comes in. Mostly under $80, the Vigoss line has quality and variety. When I decided to embark on the pink denim epidemic, I chose a pair of Vigoss Skinny Basics to cure my need for bubblegum bottoms. 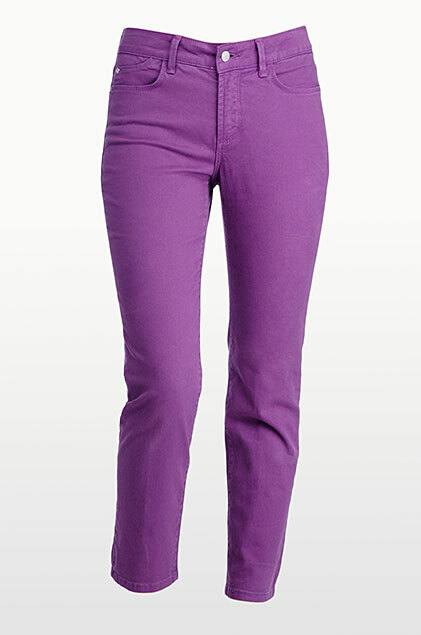 New to my wardrobe and already promoted to I will these everyday jeans status are my Eddie Bauer Straight denim in Deep. 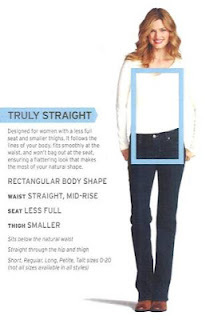 Never in a million years would I think I'd fit my Kardashian like bottom into a pair of jeans marked straight. At a recent denim fitting event held by the Eddie Bauer team, I fit better into a pair of straights than I did the curvy. The straight fit was more flattering because I defiantly know my hips do not lie. To come up with this line, the design team surveyed over 400 women and from that created three fits, Truly Straight, Slightly Curvy and Curvy. Like a Wacoal bra expert, the on site fit experts let me try on a pair of Curvy that I insisted on but after trying on and gauging the opinion of a group of well jeaned ladies, I tried on the Straight and I burst out of the fitting room beaming with pride. 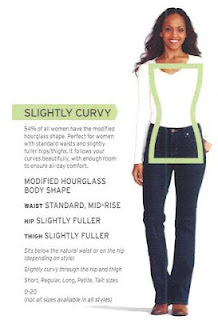 Turns out what I deem as 'curvy' doesn't exactly flow with the cut of Eddie Bauer's curvy denim. None the less, my booty looks great, my legs look long and my waist looks smaller defining elements of the perfect jean.